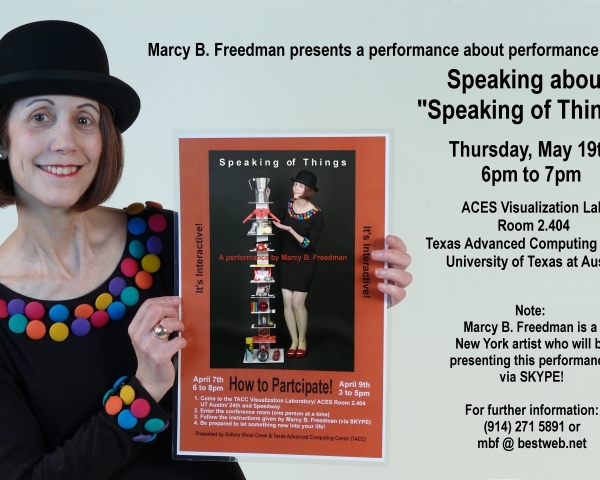 I was invited to do a performance at the University of Texas at Austin in conjunction with an arts festival. When it became clear that my schedule would not allow me to travel at the appropriate time, I got permission to do my performance via SKYPE. Prior to the performance, I sent boxes and boxes of miscellaneous “things” to the site. 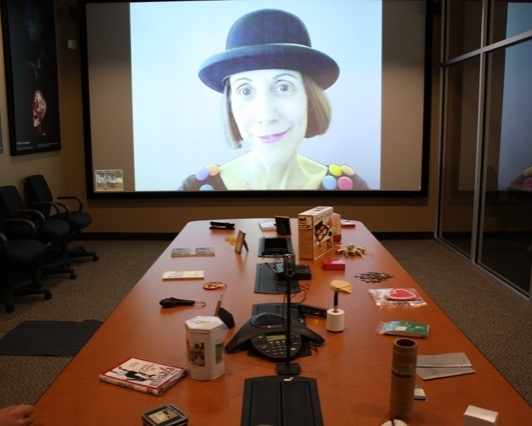 On the day of the performance, these items were displayed on a large conference table in front of the SKYPE screen on which I would be seen. A participant would chose an item, and I would tell him or her a story about the item. Then, the listener had to decide if the story had been true of false. If the person had been correct in assessing the veracity of my story, he or she was allowed to keep the item that had been discussed. However, there was really no way for the person to know if I had been honest in stating whether my story had been true or not! Ultimately — for some unknown reason — most people trusted me. Indeed, this project seemed to foster a bond between the participants and myself. Trust is a good thing. Well, a lot of people told the festival administrators that they had really enjoyed my project. So, I was invited to give talk – via SKYPE – about it. This talk was called “Speaking about Speaking of Things.” Naturally!